You drive a fuel efficient car, recycle and bring your own reusable shopping bags to the store. But how can you work on reducing your carbon footprint at home? For more Americans, heating and cooling your home accounts for nearly 50 percent of personal carbon emissions. Adequate insulation. Check your home's insulation to make sure you're not losing that warm air your home works so hard to provide you with. Energy Star systems. From windows to appliances, using Energy Star-rated systems can help your home work more efficiently. Programmable thermostats. 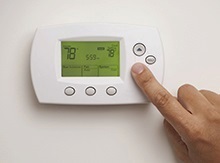 Set your thermostat to lower the temperature of your home when you're out, or asleep. Smarter lights. Switch from old, incandescent light bulbs to new light emitting diodes (LED) options which last longer and use less energy. Monitor water use. Many of us use over ten gallons of water a day. Take shorter, cooler showers, make sure your dishwasher or washing machine is full when you run it, and turn off the faucet when brushing your teeth or shaving.